Do you sell a document feeder Kit for the Hewlett Packard LaserJet M4555 MFP or is this part supplied in the maintenance kit? We only have the HP CE732A maintenance kit currently in stock for the HP LaserJet Enterprise M4555 MFP which contains a replacemnt 220V fuser. Unfortunately, we don't stock the HP CE248A ADF printer maintenance kit which contains the document feeders. Please contact HP directly to source this item. Designed for medium to large-sized offices and businesses, the HP LaserJet Enterprise M4555 MFP is a multifunction printer. Dont be fooled by its small size. This workhorse is capable of delivering 250,000 pages per month. It has quick print speed and has a maximum print resolution of 1200 x 1200 dpi. The HP LaserJet Enterprise M4555 mono laser multifunction printer can only handle monochrome print jobs, however, and faxing is optional. 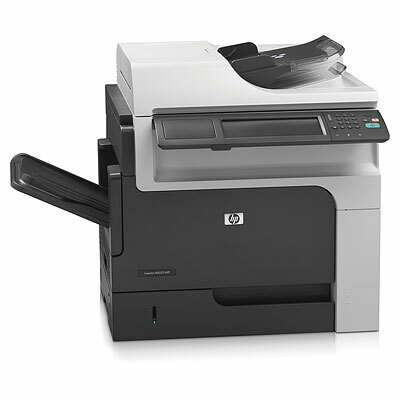 The HP LaserJet M4555 MFP laser printer is not just quick  it also delivers good quality scans, copies, and prints. The HP M4555 multifunction printer comes with built-in Ethernet for easy networking and also has an automatic document feeder and automatic duplexer for double-sided printing, copying, and scanning. The HP M4555 MFP LaserJet Enterprise printer is compatible with Macintosh and Windows computers. This unit is easy to use, thanks to its 20.5 cm touchscreen display. For increasing productivity and decreasing output costs, this unit can accept a high capacity black HP LaserJet Enterprise M4555 toner capable of printing up to 24,000 pages.